You’ve seen their viral videos – now get ready to see them live. 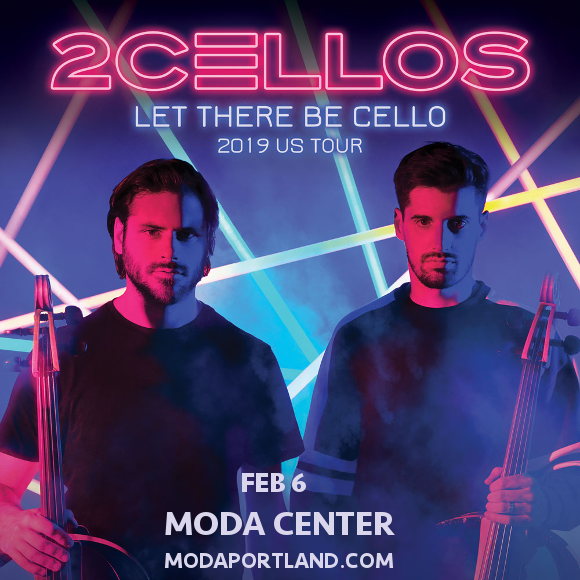 That’s right – far more than just a YouTube phenomenon, 2Cellos have made a name for themselves in the contemporary/classical world, reinventing the instrument and everyone’s ideas about it. They’re bringing their unique high-energy live show to the Moda Center on Wednesday 6th February 2019 – it’s going to be phenomenal!! Don’t miss out – get your tickets today!! Formed of classically trained Luka Šulić and Stjepan Hauser, the duo followed in the footsteps of bands such as Apocalyptica with their metal-influenced renditions of pop and rock songs, in addition to their reinventions of classical pieces. After huge viral success, the band now look forward to releasing their new album “Let There Be Cello”. We can hardly wait – can you?? If not, then don’t delay – hurry up and grab those tickets! !